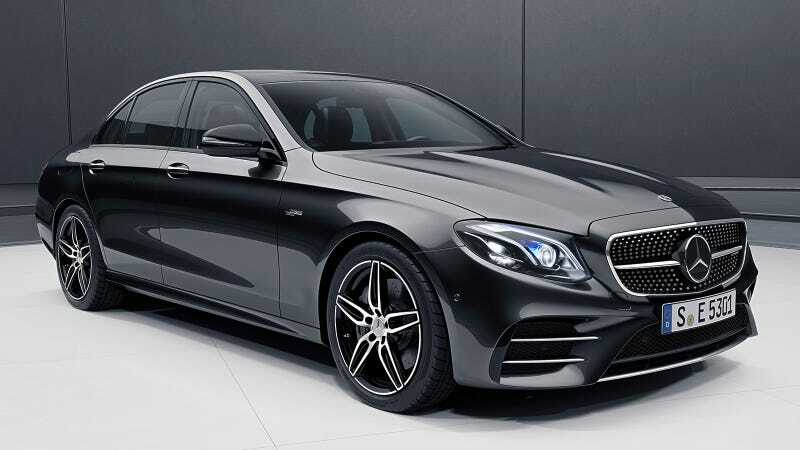 The 2019 Mercedes-AMG E53, with an inline six-cylinder engine mated to a 48-volt electrical power boost system, is breaking new ground for sport sedans. Mercedes announced the “53” range of mild hybrid AMG cars back in January and today it’s officially unveiled this version of the E Class. Mercedes describes the powertrain as an “electrified AMG-enhanced” engine “with EQ Boost featuring an electric auxiliary compressor.” Practically speaking, what’s happening here is that the big energy system is going to power some of the car’s power-hungry components like electric steering while a standard 12-volt system will run lights and power seats and such. The engine is rated to make 429 horsepower and 384 lb-ft of torque, which is supplemented by the above-described EQ Boost system effectively adding 21 HP and 184 lb-ft of torque. Theoretically, the E53 should benefit with super-smooth acceleration and loads of power in the low and high RPM ranges. Mercedes-Benz officially estimates a 4.4-second 0 to 60 sprint and has electronically limited the top speed to 130 mph. This car, in sedan, coupe or cabriolet convertible form, will run a nine-speed automatic transmission called AMG Speedshift TCT 9G that’s supposed to be super-snappy and smooth. It will work with the AMG Performance 4Matic+ all-wheel drive system which changes between rear-drive and all-wheel drive depending on your driving preferences and conditions. I’m not sure whether or not AMG’s “Drift Mode” will make it to this car, but it sounds like it will have plenty of power to be a decent driver. Multi-chamber air suspension will manage the E53’s damping and ride quality, which I’m also curious about. Air shocks probably wouldn’t be my choice for responsiveness, but I’m willing to keep an open mind here. Mercedes, obviously, will have designed the system to optimize a balance between performance and comfort. What will really be interesting to behold in person will be this car’s sound. An auditory presence is a huge part of the AMG experience, regardless of how many cylinders are involved, and I’m very curious to find out what kind of music the EQ Boost-equipped E53 can make.